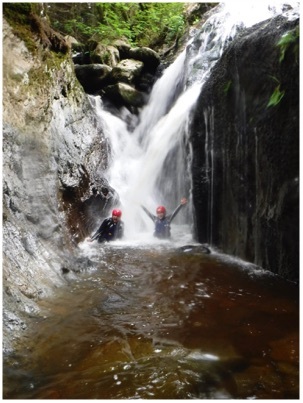 Gorge Walking/ Scrambling is run all year round. Gorge Scrambling or walking is a journey up or down a gorge, scrambling past waterfalls and pools over the rocks. There are all sorts of challenges to overcome when gorge walking. You will find yourself traversing along rock walls and jumping from boulder to boulder. As the day goes on you will be climbing waterfalls and sliding down water washed channels. There are squeezes to raise your heart rate and if that is not enough jumps into deep plunge pools. Getting wet is part of the fun and there are plenty of chances to jump into the deep plunge pools or slide down natural flumes in the rock into deep pools. The gorges we use in Snowdonia are beautiful picturesque places. Check out our movie at the bottom of the page to see what it is all about.